(TibetanReview.net, Aug20, 2015) – A large group of Chinese police, including about 100 members of a special task force, had on Aug 10 severely beaten a group of elderly Tibetans and their womenfolk who were protesting against the building of a Dam in Yazi (or Dowi, Chinese: Xunhua) County of Tsoshar Prefecture, Qinghai Province, reported Radio Freed Asia (Washington) Aug 18. It added that an unknown number of the protesting villagers were injured while a few of them were taken away. The Tibetans were reported to fear that the building of the dam was linked to mining operations in the area for extracting, gold, copper and other minerals. The Tibetans had been trying to stop the building of the dam, which is located near the county’s Seching Village, since the beginning of the year as it would facilitate further expansion of the Chinese mining operations which were already damaging to their livelihood and health. 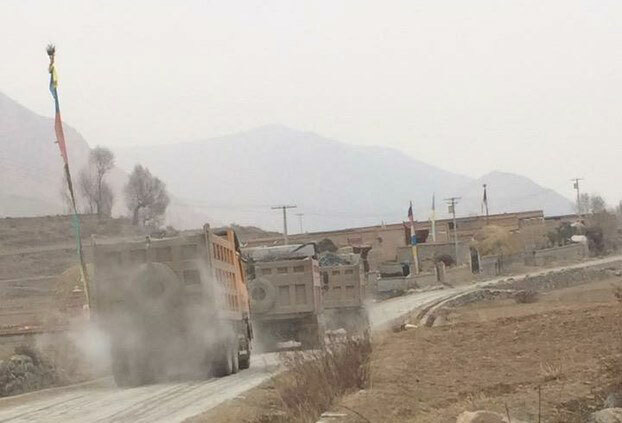 The Chinese attack on the protesters at the dam building site came when only the elderly and womenfolk were present, with the younger Tibetans being away on field work. The report cited an area resident as saying the protesters were taken away to a secluded spot where they were severely beaten. When villagers went to the county chief the next day to complain about the uncalled for police brutality, he refused to meet them. Instead, he sent out two officials to rebuke the crowd. The villagers believe that the mining work in the area had not been approved by authorities above the county-level and local officials and Chinese businesses had colluded to enrich themselves at their expense.